The 7.5 Magnitude Tangshan earthquake struck on July 27, 1976 at 19:42 (GMT), (July 28, 3:42 AM local time). Tangshan is a densely poplulated industrial city of a million people 90 miles east of Bejing. The intitial quake was followed by a major aftershock 15 hours later. Official estimates put the death toll at over 240,000, although unofficial sources estimates run as high at 655,000, with 800,000 injuries. This is the greatest death toll recorded for an earthquake in the last 400 years. 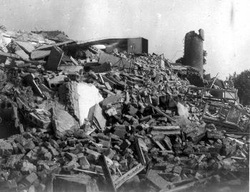 Damage in the city was widespread and devastating, with 93% of the buildings in the city destroyed. There was major damage that put hospitals, water pumping stations and sewage lines out of commision. Relief workers attempting to help caused a massive traffic jam on the only road left open into the area. Most roads were covered in debris and riddled with fissures. Neighbors organized teams to dig out survivors immediately following the quake. The damage was worst in areas with deeper, sandy soil and a high water table where the shaking tends to be more pronounced. In areas with bedrock closer to the surface, buildings did much better. Building codes were not stringent enough to protect against a quake of this magnitude. In retrospect, there were some warning signs that a major earthquake was on the way, but nothing definitive that would cause authorities to react as they did when they evacuated the city of Haicheng the previous year, just prior to a large earthquake. Part of the problem was that scientists didn't expect so large a quake in that area. Therefore, they weren't monitoring the area for signs of an impending quake. The precursors were not as pronounced as at Haicheng and some occured too late for anybody to act on them. Reports of odd animal behavour, such as a goldfish repeatedly attempting to jump out of its bowl, were not pervasive enough to cause concern. It is very difficult to know to what extent these episodes are selectively remembered after the fact. It could be that animals behave oddly from time to time but when it happens to occur before an earthquake it is remembered as a sign of the impending quake. At other times these episodes are forgotten. On the other hand, a large spike in reports may means something. With the exception of the Haicheng quake, efforts at prediction through analysis of this kind of report have not been successful. The Tangshan quake was a reminder that the excitement following the Haicheng prediction was premature. See The Earthquake Museum's Studying Quakes page for more information on Earthquake prediction. Here is the USGS Page on the Tangshan Quake .